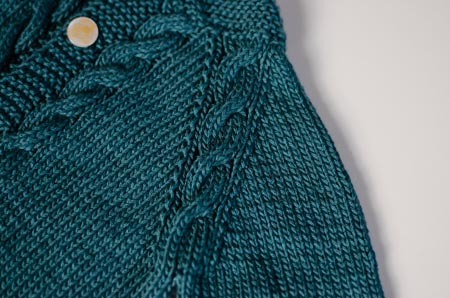 The Sunnyside Cardigan knit up very quickly! What a lovely little pattern! 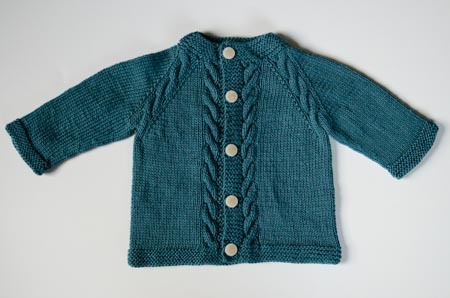 Pattern: Sunnyside cardigan by Tanis Lavallee. I knit the smallest size, but tweaked the numbers a bit for a different gauge. I also reversed some of the cables, as so many have done on Ravelry. ETA: I would recommend going down a needle size when knitting the garter stitch cuffs and hem. The pattern doesn’t specify to do so, and they flare out a bit. Yarn: Gedifra Florida in color #1482, Dark Seaglass. Love this color! I think it works well for both adults and babies. As I mentioned before, the yarn is very splitty, and I think a bit unforgiving of any tension wonkiness (you can see it in the last photo in this post), but overall I really enjoyed using it. I also suspect that the yarn would hold up if machine washed, though I haven’t given this a try. For knitting this sweater, I used less than 2 skeins. 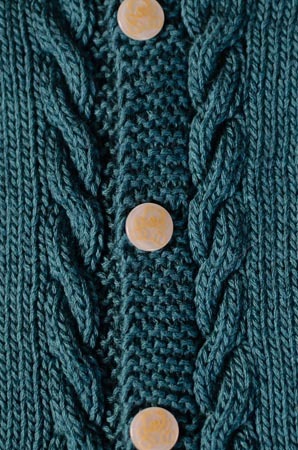 Needles and gauge: I used US 3 needles to knit this sweater, and my gauge was about 6.5 stitches and 9 rows per inch. Finished measurements: 18.5″ chest circumference, 4.5″ sleeve length to underarm, 9.75″ shoulder to hem. I think this sweater will fit a 3-6 month old, with a bit of roominess in the chest. I put sort of cutesy baby buttons on this one – not really my first choice, but that’s all I could find at the local Joann’s that was a good match for color and size. One interesting note about this pattern – it’s worked from the neck down, and uses M1L and M1R for the raglan increases. That’s not something I’ve seen often, I think k-f/b and yo are more common. Anyway, I love a well-placed M1L and M1R, don’t get me wrong, but making 8 of them every other round for the entirety of the yoke was tiring, especially when using a splitty yarn. Nonetheless, I persisted, and absolutely love how they turned out after all was said and done! It’s like a fancy little chain! Anyway, this knit up quickly and easily, two thumbs up! Gorgeous! I’ve had this sweater in my queue for quite some time – guess I’ll have to put it at the top! This is lovely. I’m kind of in love with sock yarn sweaters, so I will have to add it to my list! The just-right button situation is getting critical – whatever shall we do?